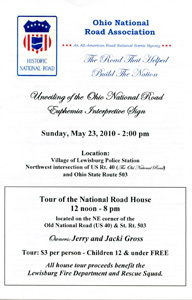 The second Ohio National Road Interpretive sign was unveiled at Lewisburg, Ohio on May 23, 2010. 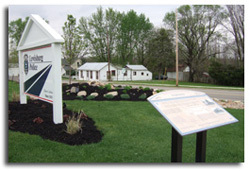 This sign is located near the Village of Lewisburg Police Station at the NW corner of the intersection of US Rt. 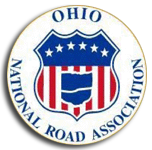 40 (the old National Road) and Ohio State Route 503. This part of Lewisburg was the original village of Euphemia, and its history is depicted on the sign. 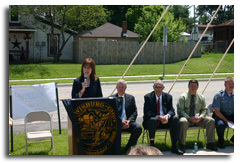 Pictured left to right: ONRA President Cyndie Gerken (at podium), Lewisburg Mayor David Scott, Preble County Commissioner and ONRA Board member David Wesler, Tri-County North Local Schools Superintendent William Derringer, and Lewisburg Police Chief Richard McGee. 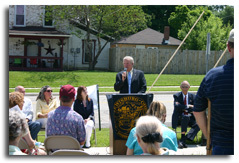 Commissioner David Wesler (at podium) thanked Village of Lewisburg Administrator Jeff Sewert as well as Preble County Historical Society Director and ONRA Board member Jane Lightner for planning this event. 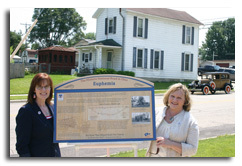 ONRA President Cyndie Gerken (on left) and Preble County Historical Society Director Jane Lightner stand beside the newly unveiled Euphemia Interpretive sign. Village of Lewisburg residents Jerry (at podium) and Jacki Gross spoke about their newly restored Toll Road House (brown building in the back left of this photo) and how the community has responded to their project. 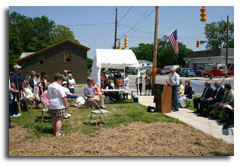 A Grand Opening was held at their 1836-39 structure (which had been slated for demolition in 2009) in conjunction with the sign unveiling. Proceeds benefited the Lewisburg Fire Department and Rescue Squad. 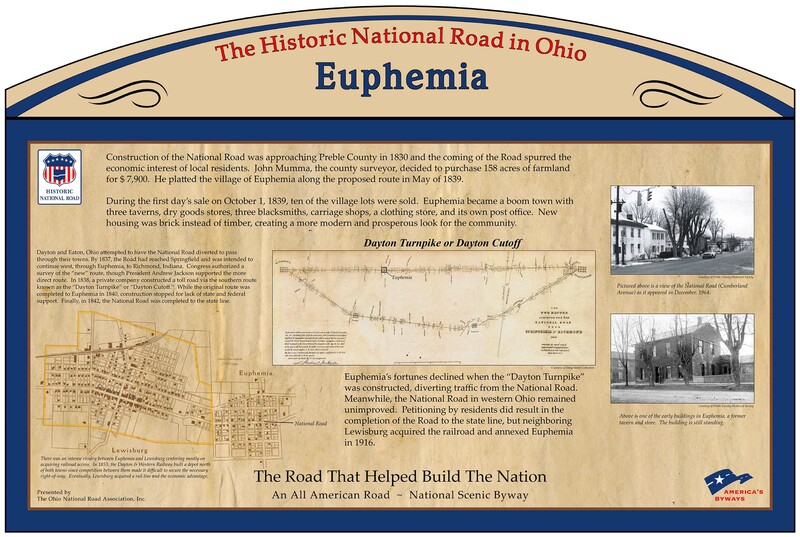 The Euphemia Interpretive sign has been installed on the NW corner of Commerce Street and West Cumberland Street (US 40/National Road), near the Lewisburg Police Department located at 100 W. Cumberland Street in Lewisburg, OH 45338.